Gingher Gold Handled Epaulette Embroidery Scissors  - $21.50 : Yarn Tree, Your wholesale source for cross stitch supplies. Item 3579. 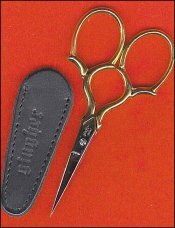 Gingher Gold Handled Epaulette Embroidery Scissors. These 3½” embroidery scissors are a reproduction of an 18th century French pattern. The very sharp blades come to a fine point. The gold handled come with nickel plated blades; the chrome version features a double chrome plating over nickel. From Gingher. Gingher G-ET.